ANTIFA CREATED BY THE DEEP STATE, NO DIFFERENT FROM ISIS! A DIRECT ATTACK ON THE USA FROM TRAITORS WITHIN INCLUDING CIA OPERATIVES. The story of Antifa is at least eighty years old. It goes back to the postwar days of communist revolution, organized street violence and class warfare in the cities of post-World War I Europe. It's a story of violence, murder and intimidation, a war which has been going on for almost a century. Unfortunately for the world, all too often it appears only one side is fighting in this war. And far too many conservatives, including Republican leaders such as Speaker of the House Paul Ryan and former GOP presidential nominee Mitt Romney, take Antifa at their word when these radicals claim to be fighting against racism and fascism. The truth is that Antifa is fighting for communism. Its members are fighting for anarchy. And they always have been. A MUST HEAR, ESPECIALLY IF YOU ARE INVOLVED IN ANY OF THE LEFTIST GROUPS CREATING VIOLENCE ACROSS THE COUNTRY. YOU ARE BEING CONNED AND THIS YOUNG MAN KNOWS FOR A FACT, BECAUSE HE WAS ONE OF YOU! HE IS NO LONGER ONE OF YOU BECAUSE HE WOKE UP TO THE FRAUD OF LEFTIST GROUPS LIKE ANTIFA ET AL! Now these sick people are attacking animals? Useful idiot losers run by the globalists. THE SICK LITTLE BOY COWARDS CONTINUE BEING GLOBALIST SHILLS! A spokesperson for BuzzFeed declined to comment on the matter. Oakes, who does not report to the websiteâ€™s U.S.-based science desk, did not immediately respond to a request for comment. So, yeah, they have to hate you for any reason, in order to get what you have. It musters them up to become psychopathic killers. Additionally, to keep their fervor revved up, new, ridiculous reasons are presented for them to keep up their hatred. Things like all whites are satanic and need to be killed. The globalists have the antifa believing they will be richly rewarded. What antifa doesn't understand (as others who were the "antifa" in other taken-down countries know) is that it is just a way to get them to work and take down the country. They are rounded up shortly afterward for a physical, manual labor workforce and killed off. They are killed off because now they are the ones who hate the power structure the most. Because, they did not get what they were promised. The track record is the same in all communist take downs. Hundreds of them. Pray for America and Humanity to succeed. Although Marx advocated the use of any means, especially including violent revolution, to bring about socialist dictatorship, he suggested ten political goals for developed countries such as the United States. How far has the United States -- traditionally the bastion of freedom, free markets, and private property -- gone down the Marxist road to fulfill these socialist aims? You be the judge. The following are Marx's ten planks from his Communist Manifesto. The courts have interpreted the 14th Amendment of the U.S. Constitution (1868) to give the government far more "eminent domain" power than was originally intended, Under the rubric of "eminent domain" and various zoning regulations, land use regulations by the Bureau of Land Managementproperty taxes, and "environmental" excuses, private property rights have become very diluted and private property in landis, vehicles, and other forms are seized almost every day in this country under the "forfeiture" provisions of the RICO statutes and the so-called War on Drugs.. In the U.S., communication and transportation are controlled and regulated by the Federal Communications Commission (FCC) established by the Communications Act of 1934 and the Department of Transportation and the Interstate Commerce Commission (established by Congress in 1887), and the Federal Aviation Administration as well as Executive orders 11490, 10999 -- not to mention various state bureaucracies and regulations. There is also the federal postal monopoly, AMTRAK and CONRAIL -- outright socialist (government-owned) enterprises. Instead of free-market private enteprrise in these important industries, these fields in America are semi-cartelized through the government's regulatory-industiral complex. We call it the Social Security Administration and The Department of Labor. The National debt and inflation caused by the communal bank has caused the need for a two "income" family. Woman in the workplace since the 1920's, the 19th amendment of the U.S. Constitution, the Civil Rights Act of 1964, assorted Socialist Unions, affirmative action, the Federal Public Works Program and of course Executive order 11000. And I almost forgot...The Equal Rights Amendment means that women should do all work that men do including the military and since passage it would make women subject to the draft. So, is the U.S. a "free country" today? Hardly! Not compared to what it once was. Yet, very few Americans today challenge these Marxist institutions, and there are virtually no politicians calling for their repeal or even gradual phase-out. While the United States of America may still have more freedoms than most other countries, we have nonetheless lost many crucial liberties and have accepted the major socialist attacks on freedom and private property as normal parts of our way of life. The nation, whose founders included such individualists as Thomas Jefferson, George Mason, James Madison, John Adams and Patrick Henry, has gradually turned away from the principles of individual rights, limited constitutional government, private property, and free markets and instead we increasingly have embraced the failed ideas and nostrums of socialism and fascism. We should hang our heads in shame for having allowed this to happen. But, it is not too late to reverse these pernicious burdens and instead enact pro-freedom reforms to put our nation back on track again. It can be done. In some ways the Left has a head start over us on the pro-freedom Right. The enemies of American freedom do admittedly dominate the entertainment industry, television news media, and academia -- but we have the tremendous strategic advantage that reality (including man's nature) is on our side; so, unlike the socialists and "liberals" (welfare-state fascists), we are not in the position of having to advocate a system which constantly tries to "make water to go uphill" -- or force human beings into a rigid utopian staitjacket based on the whims of some clique of central planning bureaucrats. We know that individual freedom for peaceful people within a constitutional republic works in practice; our country's history demonstrates that. The piecemeal abandonment of those principles and institutions which once made America great has proved to be a a dead-end road to failure. That is why I tend to be a long-term optimist even though things often look pretty glum in the meantime. Just as Prohibition was eventually repealed, I feel encouraged that such key statist achievements as the income tax, government schools, fiat money/central banking (the Federal Reserve), "environmentalist" regulations, property forfeiture laws, and other Marxist planks and leftist institutions can be rolled back and repealed altogether, although it may take several decades. Those who would carry forward the ideas and principles of self-ownership, private property, free markets, laissez faire, the rule of law, and constitutionalism which informed America's founders must become more active on the key ideological battle fronts. We need more influence not just in politics, but in areas of entertainment, academia, journalism, think tanks, churches (we need our own individualist Walter Rauschenbushes), literature, art, and other venues of expression and activism. Marxism and socialism have proved to be colossal failures all over the world. As Frederic Bastiat wrote in his classic The Law just prior to his death, "let us now try liberty"! THESE PUNKS NEED TO BE ARRESTED AND CHARGED WITH TREASON. THEY ARE VIOLENT AND VIOLENCE IS NOT PROTECTED BY THE FIRST AMENDMENT. TIME FOR HEADS TO ROLL OF ANYONE INVOLVED WITH THIS GROUP! ENOUGH! Mission to Moscow is a book by the former U.S. Ambassador to the Soviet Union Joseph E. Davies and a film based on it directed by Michael Curtiz in 1943. ... why Warner Bros. spent $2 million on a movie glorifying our new allies, the Soviet Union, and more specifically the mass murderer Josef Stalin. individuals affected by the blacklist. Here is the schedule. 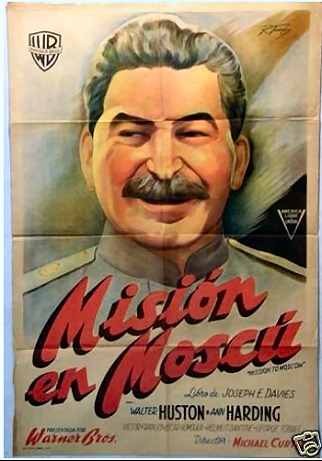 one film, Director Michael Curtiz Mission to Moscow (1943) had been branded by the House Committee of Un-American Activities as pro-Stalinistic. Jack Warner decided a film version of the book could serve as a Warner Brothers contribution to the war effort and perhaps turn a handsome profit. He was sure the Roosevelt administration strongly approved of the bookâ€™s sentiments and signed a contract with Davies in July of 1941. Most unusual for the time was the provision in the contract that Davies would have final approval of the script. Warner erroneously thought this was merely a formality and that like other authors, Davies would just sign off on the professional script the Warners organization would generate. Such was not the case. For openers, Davies insisted that Erskine Caldwell, the left-oriented author of novels like Tobacco Road, be assigned to write the script even though Caldwell had little experience as a scriptwriter. The resulting script, which followed the book closely, was so poor that a year later Davies agreed to pass the project on to future blacklistee Howard Koch, who would soon win an Oscar as co-scripter of Casablanca (1943). Koch began rewrites in late August of 1942. So, why would anyone want to pay attention to, or join antifa ? He received his B.A. from the City College of New York in 1940, where he majored in history and was part of a small but vocal Trotskyist anti-Soviet group who eventually became The New York Intellectuals. lcove One held leftists of various stripes; Alcove Two housed the Stalinists, including a young Julius Rosenberg. The Stalinists outnumbered the anti-Stalinists by as much as 10-1, but among the anti-Stalinists were Mr. Bell as well as the future sociologist Seymour Martin Lipset and the future literary critic Irving Howe. Mr. Howe recruited Mr. Kristol into the Trotskyists, and though Mr. Kristolâ€™s career as a follower of the apostate Communist Leon Trotsky was brief, it lasted beyond his graduation from City College, long enough for him to meet Ms. Himmelfarb at a Trotskyist gathering in Bensonhurst, Brooklyn. antifa's true danger is twofold: First, its violence does obvious and unjustifiable harm, both to free speech and to people and property; second, it tends to discredit, through association, the far broader peaceful movement against racism and hate. That movement must win if the United States is to flourish, and it can win only by upholding democratic norms and the rule of law, even in the face of everything the ultra-right may do to undermine them. Accordingly, "no enemies on the left" cannot be the rule, at least not as long as antifa is around. These people proudly are not liberals or democrats, much less liberal Democrats. To the contrary, if anyone should have qualms about the way police retreated when 100 antifamembers showed up in Berkeley on Sunday - if anyone should be urging police forces across the country to deal firmly but appropriately with them - it's the peaceful marchers against racism in that town, whose message was drowned out by the far more vivid violence of their ostensible defenders in black. The goons and useful idiots of the globalists, ANTIFA, are deployed once again. What losers! Who backed and financed Antifa in USA ? "Follow the money" ( Alex Jones ). Not only do they regularly say that violence is acceptable, but they regularly employ violence against peaceful individuals. In fact, Antifa has a history of regularly attacking women who have a different point of view. Oh, but the hypocritical left and their globalist comrades think there is nothing wrong with their violence. THESE PEOPLE ARE CRIMINALS RUN BY THE GLOBALISTS, NOT LEGITIMATE PROTESTERS. THEY NEED TO BE ARRESTED FOR THEIR CRIMES. Infowars Owen Shroyer encounter with these unAmerican criminals. No real American would act like these animals. Only useful idiots of the deep state globalists act like this! Arrest one who pay Antifa. Today?s fascists call themselves ?anti-fascists.? Just like the Nazis, they are totalitarian: they are determined not to allow their opponents to murmur the slightest whisper of dissent. Forcibly suppressing the speech of someone with whom one disagrees is a quintessentially fascist act. These fascists will target you for destruction if you oppose jihad mass murder and Sharia oppression of women and others. Mainz (ots) ? The University of Mainz today held an event on ?Islamization and anti-racist appeasement.? This planned event was disturbed by a group of about 30 people around 6:10PM, so the police were called to it. The protesters held up banners and loudly expressed their displeasure. The organizer canceled the event due to the incident. The police subsequently monitored the exit of the protesters and those attending the event. In one case, there was a dispute between two people, which was settled. One of the participants refused to have his personal details taken, so he was taken to the police station. While on the way there, he tried to kick the head of the driver of the patrol car, but failed. The man was, after his personal details were taken, was released. One has to ask why the "proud Boys are having a rally in the Antifa Stronghold of Portland ? Just asking .. OK ... Seems to me it would only lead to trouble .... which seems the whole point .. to shutdown conservative rallies not controlled by who ? Patriot Prayer and Proud Boys. The clashes and violence were between the police and the Antifa instigators who showed up to start fight. Real Americans are sick of the anti American thugs run by Soros types. Antifa and other globalist run punks will not steal the freedom of Americans. Real americans are taking back their country. Period! People are seeing the real Left now! Antifa reportedly clashed with U.S. Secret Service agents in front of the White House on Sunday, as far-left counter protesters demonstrate against white nationalists attending the ?Unite the Right? 2 in Washington, D.C. So who is approving "counter" protests same day and location ? I doubt it... but the authorities implicitly allow ? Notice backpacks that could contain ANYTHING remember Boston ? Watch ? Antifa Chants Death to America: ?No Borders! No Wall! No USA at All!? In a video by Breitbart News? 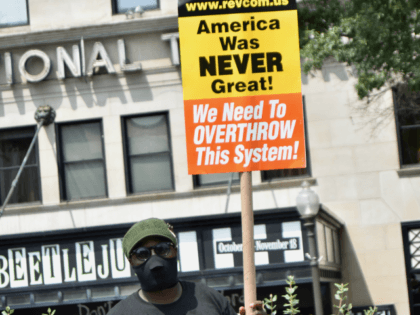 Ian Mason, Antifa members and open borders activists can be heard and seen marching down streets throughout Washington, DC, demanding an end to the United States. ?No border, no wall, no USA at all!? Antifa and open borders activists chanted. 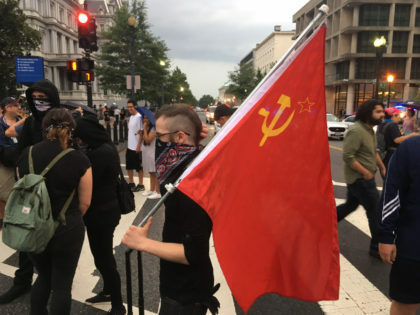 So it comes out full circle .... showing there true communist colors ..
CNN anchor Chris Cuomo said in a lengthy commentary that violent leftists Antifa ' who gather in masked black-clad mobs and carry out beatings, riots, and property destruction ' are 'on the side of right' because their behavior, although criminal, is done in the name of stamping out hate. Cuomo's message Monday came on the heels of violent Antifa demonstrations over the weekend in Charlottesville, Virginia 'including attacks on police and journalists ' marking the one-year anniversary of deadly riots there. New York Gov. Andrew Cuomo may have just handed Republicans a ready-made campaign ad for his rumored 2020 presidential bid ? by declaring Wednesday that America ?was never that great.? The Democratic star made the seemingly offhand remark as part of his rebuke of President Trump's "Make America Great Again" slogan during a bill-signing in New York. But the line drew gasps from the crowd. 'We're not going to make America great again. It was never that great,' Cuomo said, to an awkward blend of gasps and chuckles. Within hours, his spokeswoman tried walking it back. ?Dr. 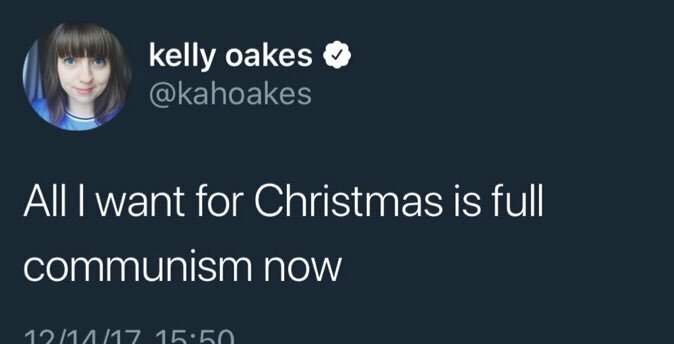 Bones," the co-host of the far-left podcast The Guillotine, started the conversation going with his 5,000-plus Twitter followers. Bones (@Ole_Bonsey on Twitter) asked: ?Hey quick little question for military minded lefties: should leftists train/organize in a 'insurgent' focus where they blend into a civilian population for potential attacks or a more 'militia' structure focused on holding/maintaining turf?? In the thread, Dr. Bones discouraged fellow radicals from walking around with full-sized AR rifles, suggesting that they instead use ?easily concealable platforms? [weapons] so as not to ?tip anyone off.? Portland journalist Andy Ngo told Tucker Carlson Tuesday night that police officers in the city were afraid of "inflaming" the leftist protests over the weekend. Hundreds of demonstrators marched in the city's streets on Saturday after the fatal police shooting of Patrick K. Kimmons. Videos of Antifa activists show them directing traffic, shouting profanities at drivers and even chasing down a car and smashing its windows. This year, in addition to celebrating the Italian explorer who crossed the Atlantic in 1492, students in Portland Public Schools will honor the indigenous people who lived in the Americas long before ?Columbus sailed the ocean blue.? The Portland School Board this week unanimously voted to recognize the second Monday in October as Indigenous People?s Day, following the lead of public bodies across the nation that have taken action to honor Native Americans in tandem with or instead of the explorer. Antifa actually posted these videos of themselves attacking any motorists that came into their (illegal) protest area as shown. Their tweet matter-of-factly stated that they chased after and attacked the gentleman in his car in "self-defense". You cannot make this up. Several U.S. cities ? including Seattle, Albuquerque and Denver ? have already replaced Columbus Day with Indigenous Peoples Day. O'Farrell, who represents an Echo Park-to-Hollywood district, said his plan for Indigenous Peoples Day also establishes Oct. 12, the date of Columbus' arrival in 1492, as Italian American Heritage Day at City Hall. It would not be a day off for paid employees. Replacing Columbus Day, O'Farrell said, would right a "historical wrong." "We are not creating a racial conflict," he said. "We are ending one." One opponent of the holiday name change called it "a slap in the face" to Italian Americans. Another called it racially divisive. John Giovanni Corda, a Beverly Hills resident who identified himself as Sardinian, told the audience to "shut your mouths" after they started heckling. He told the council that O'Farrell's proposal was anti-Italian. "Why don't you stop picking on Christopher Columbus as though you're picking on our people," he said. "We never hurt you. We never wanted to hurt you." Hours after an Antifa mob showed up at the home of Fox News host Tucker Carlson, an affiliated Twitter account published his home address and the home address of his brother Buckley Carlson ? along with the addresses of Ann Coulter, Daily Caller?s Neil Patel, and Sean Hannity. Approximately an hour before Carlson?s Fox News show aired on Wednesday evening, a leftist mob showed up at his home chanting threats such as, ?Tucker Carlson we will fight, we know where you sleep at night!? The leftists were also chanting, ?No borders! No walls! No USA at all!? It is unclear if Carlson?s wife and four children were home at the time of the incident. The group left minutes after the police arrived ? and no arrests were made. Someone affiliated with DC Antifa told The Gateway Pundit that the protest at Carlson?s home was ?just the beginning.? On the plaza, officers found an injured man who said he had been punched several times. The victim told police he was at a table for the student group Turning Point USA when two men came up to the table and started arguing. The victim started filming the argument with his phone and apparently a fight began when one of the two men slapped the phone out of the victim's hand. The suspect knocked over the table for Turning Point and the pair struggled over the phone. Then the suspect punched the victim several times, injuring the man's nose and eye, police said. The suspect left the plaza before officers arrived. Police are asking anyone who has information about the case or the man in a photo released by the campus Police Department to call them at 510-642-6760. Gov. Andrew Cuomo said Friday he?s planning to run for a fourth term ? just months after cruising to re-election to his third term. ?Right now we?re facing an attack that?s unprecedented not just in the history of the NRA, but in the entire history of our country,? LaPierre wrote. ?And if this attack succeeds, NRA will be forced to shut down forever.? Insurance company Lockton provided personal liability insurance for members of the NRA?s Carry Guard program, which provides training for self-defense and other resources. According to the Carry Guard website, ?without insurance, lawful self-defense can cost you a fortune.? The insurance is no longer available in New York after Lockton was hit with a $7.5 million fine in May 2018. New York?s Department of Financial Services said the NRA is not licensed to conduct insurance business in the state. This complaint was repeated in LaPierre?s letter to donors. ?Cuomo?s tactics are already working,? the NRA says in its letter. ?One by one, more and more banks and insurance companies across the country are knuckling under to Cuomo?s threat ? and telling NRA they won?t do business with us ? because they don?t want to be targeted and crushed by Cuomo?s strong-arm tactics and the vast power of thousands of New York bureaucrats.? ?Unless we can force Cuomo to break off this attack, NRA will have no choice but to cease operations after 147 years of fighting for freedom.? Gov. Cuomo to conservatives: Get out of New York ! New York Gov. Andrew Cuomo made it clear Friday that if you?re a conservative Republican, you have no business being in New York. Cuomo defined the conservative Republican New Yorkers he wanted to send packing. ?Who are they?? he said. ?Right-to-life, pro-assault weapons, anti-gay ? if that?s who they are, they have no place in the state of New York because that?s not who New Yorkers are.? Really? If that?s the governor?s wish, he?d be looking to get rid of many patriotic Americans. RUSH: You know, folks, I was at dinner last night, and I was telling some people about the Chris Cuomo quote that I played earlier in the week, and they didn?t believe me. They said, ?Rush, surely you misunderstood that.? No, I didn?t. So I want you to hear this again. This is Chris Cuomo. He is the son of Mario ?The Pious? as you know. And he is a member of the media now. He?s morning show host over at CNN. The show?s called New Day. On Monday everybody?s celebrating Obama?s trip to Cuba, and Alisyn Camerota notices a shirt that Chris Cuomo?s wearing. She says, ?Chris, I can?t help but notice your shirt here. Tell us the history of that shirt.? Now, listen carefully, because in this sound bite is what Chris Cuomo thinks communism is. CUOMO: My guayabera? This shirt belonged to my father. It was given to him by Fidel Castro. It marked conversations going on decades ago that were the same as those today. The concern was the freedom of the people. What is the point of this communist regime if it is not to truly make everyone equal, not at the lowest level, not by demoralizing everyone, but lifting everyone up. My father, generations of politicians have been fighting this. So I wear this shirt as a reminder of that. RUSH: You know, that was one of the most teachable moments I?ve ever had. All my life I have been asking myself why so many leftists are supportive of communism when everybody knows ? I thought everybody knows communism kills, communism denies liberty and freedom, communism equals poverty, communism equals political prisons, communism builds walls that keep people in because everybody wants to leave. And in that context I?ve always said, ?How come so many of them, many in the media and most of them in the Democrat Party, how do they wax so eloquently of communism?? What was it about Gorbachev, Cuba, Che Guevara? And then it all became clear when Chris Cuomo defined it. He has been taught what?s the point of this 50-year Regime down there, he said, if it?s not to make everybody equal by lifting everybody up. My father?s been fighting this for 50 years. So these people are waiting for the great communist payoff of upward mobility, liberty and freedom, and wealth for everybody. Well, it?s no wonder. RUSH: I?m not kidding. This Chris Cuomo sound bite? I was at dinner last night with some friends, and I couldn?t? Even when quoted him accurately, verbatim, they somehow didn?t get it. Maybe they just didn?t think it was that big a deal. As somebody who came of age, if you will, in this entire arena of politics, with anti-communism being one of the animating aspects of my political education? Because it was the antithesis of freedom and liberty, and it shaped the world of my parents and grandparents. I don?t mean to beat a dead horse with it, but I think it?s so instructive in informing us what these people think about other domestic political issues in this country, why they so hate capitalism, why they so love big government, why they so love command-and-control economies. It?s all there. Communism is utopia. Communism. And they?re just waiting for the right people. What is, ?We are the ones we?ve been waiting for,? Obama?s slogan? What does it mean? ?We?re the guys who are finally going to make it happen,? and of course, it can?t work. Intellectually, economically, it?s impossible. The evidence is all over the world, and yet that?s denied, because the hope and the desire overwhelms the real. Chris Cuomo was born in the New York City borough of Queens. He is the son of Matilda (nee Raffa) and Mario Cuomo, the former Governor of New York, and the brother of Andrew Cuomo, the current Governor of New York. Cuomo was known for his liberal views and public speeches, particularly his keynote speech address at the 1984 Democratic National Convention in which he sharply criticized the policies of the Reagan administration, saying, "Mr. President, you ought to know that this nation is more a 'Tale of Two Cities' than it is just a 'Shining City on a Hill.'"